Louis Kahn." Spazio E Societa/Space & Society 18, 76 (Oct-Dec 1996): 68-71. Always Been: the Words of Louis I. Kahn (Ed. Richard Saul Wurman. Printed in English and Italian. Photographs, plans. 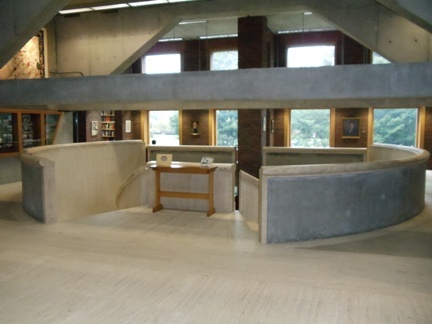 "Phillips Exeter Academy, Exeter, N.H.: Louis I. Kahn - Philadelphia." New England Architect July/August 1972: 21-24. Richards, William, "Razing the Exeter Dining Hall: Pros and Kahns." Future Anterior, Vol 1, issue 2, Fall 2004: 50-57. Academy which was completed in 1972 along with Kahn's library. Time." Architectural Record, May 1997: 94-96. American Institute of Architects. Photographs. Times 23 October 1972: 40.
the Library and other buildings. alumnus of the Academy. Illustrations, plans, sections.